Delaware based integrator and PureLink partner, Riverfront AV, was contracted by the Philadelphia Flyers to engineer a solution for distributing and routing multiple video signals that would be projected onto the ice at the Wells Fargo Center (the Flyers’ home NHL venue). Riverfront AV was founded in 2003 with the primary focus of supporting the audiovisual and electronics needs of the Chase Center, a large special events facility in the riverfront section of Wilmington, Delaware. They quickly became a trusted regional player in the market and grew rapidly, merging and acquiring other entities with whom they had significant synergies, while expanding their reach. By 2008 the company had grown to leverage quality product lines and expand its engineering and installations personnel. An attractive corporate acquisition, Riverfront AV was purchased by Light Action, Inc. in that same year and integrated with the organization’s sister companies: Staging Dimensions and Applied Electronics. Armed with the versatility of this unique mix of corporate capabilities, Riverfront AV continues to grow and add to its customer base. The Philadelphia Flyers are a championship NHL franchise, with a legacy of commitment to victories, fans and the community. They are members of the Metropolitan Division of the Eastern Conference. Part of the 1967 NHL Expansion, the Flyers were the first expansion team in the post-original six era to win the Stanley Cup, victorious in 1973-74 and again in 1974-75. The Flyers have played their home games on Broad Street since their inception, first at the Spectrum from 1967 until 1996, and then at the Wells Fargo Center from 1996 to the present. This 20,000+ seat, multi-purpose indoor facility is currently owned by Comcast Spectacor, which also owns the Flyers, and is operated by its arena-management subsidiary, Global Spectrum. The ice rink in this newly renovated sports and entertainment arena uses high-powered laser fired projectors flown over the ice to display HD content, motivating the crowd as part of the modern sports fan’s media-rich and increasingly immersive live event experience. A single-fiber transport solution was critical for this design to ensure that the 4K signals from the media server reached the projectors without degradation. Other design challenges included the long transmission distance between sources and displays, as well as discreet and safe implementation of the wiring throughout the facility where large groups of people would constantly be moving from one area to another. Additionally, as these video presentations were to be played at certain critical junctures during games or between periods, there could be no lag or delays. The content had to run smoothly, without interruption, and in complete synchronization with the accompanying audio. A quality matrix switch would be necessary to ensure consistency and reliability of the signals at these critical moments. Lastly, as with any large-scale integration project, the system manufacturer’s ability to provide effective communication and real-time support to the integrator during the full scope of the installation process would be an important factor. John Donlevie, VP of Operations at Riverfront AV, was tasked with finding the optimal solution to bring this on-ice video show to life and choosing a supplier that met all their service and technology requirements. “We had worked with PureLink before, and we knew that they understood the realities and critical timelines involved in these types of applications,” stated Donlevie. “In show business, as they say, ‘the show must go on’ and PureLink is a solid manufacturer that understands that; they know that our projects don’t have tomorrow to get it right,” he added. For the Wells Fargo Center, the PM-16X matrix switching system was implemented to feed Ultra HD/4K video to eight Barco UDX-4K32 (30,000 lumen) laser-fired projectors. Featuring a hybrid, cross-platform architecture with built-in “Don’t Blink” Fast Switching Technology, the PM-16X houses a combination of up to 16×16 UHD I/O options, including HDMI, DVI, 3G/HD-SDI, HDBaseT, and Fiber, for distributing analog and digital sources up to 4K. PureMedia offers advanced proprietary technologies including automatic up/down-scaling and frame rate conversion powered by Motore™, delivering smooth motion performance and seamless reproduction on every display. Its flexible mounting options and low-profile design were also key considerations in this application. PureMedia’s PM Tools™ Control Software was another reason the PM-16X was selected. 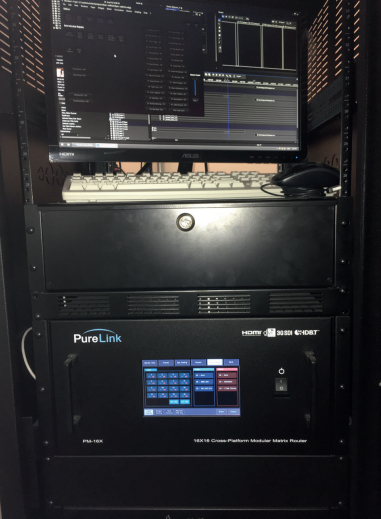 PM Tools is an application that allows easy configuration and management of any PureMedia™ matrix switcher from a Mac or Windows PC via RS-232 or LAN control. The interface fully mimics the touch-screen panel of the PM chassis, providing real-time feedback and critical system diagnostic functions including I/O port capacity and channel settings as well as signal status, test pattern generation and output resolution scaling. This web UI control, along with the 4K HDMI over fiber element of this solution were among the most important features and functionalities that Riverfront was looking for to get the job done properly. The fiber backbone solution in the arena utilized PureLink’s TotalWire™ TWF2-1000 3mm jacketed multimode duplex fiber optic cables. The advanced optical glass fibers in these cables are much stronger, safer, and faster terminating than other typical fibers, providing superior strength and increased safety in the field. These duplex style cables provide the ultimate durability and bend, with ease of termination. PureLink’s TWF2-1000 fibers are protected at the glass level via their integral polymeric coating, increasing both bend and tensile strength with ultra-low attenuation loss on tight bend radius, making them ideal for the intricate pathways they would have to travel within the arena. PureLink delivered to Riverfront the expertise and support that was essential in putting this solution in place. The system worked flawlessly and the HD video projection is currently doing its job exciting the hockey fanbase of the home team on a regular basis. Validating the company's focus on its "PureLink People," Donlevie further commented on PureLink's local representative Pat Conneen. “Pat has always been a frequent visitor keeping us up to date on all of his lines,” said Donlevie. “[PureLink] had a good mix of solutions at a workable price for this project, and Pat was instrumental in paving the way for the advance replacement that became necessary and the other technical assistance that was required during the installation process,” he added. More than a manufacturer, PureLink acts as a technology partner to their integrators, troubleshooting and supporting their products at any point necessary during the design, installation and testing of the application. “Their tech support, by real humans no less, was remarkable,” said Donlevie. “Their proximity to us here on the northeast corridor was extremely handy as we were able to send folks to the warehouse and expedite the shipping situation,” he concluded. “Riverfront did a great job selecting, setting up and installing the PureLink equipment,” stated Anthony Gioia, Senior Director of Game Presentation for the Philadelphia Flyers. “They certainly picked the right gear for our needs, and they were able to do it for a lot less than some of the bigger, more well-known integrators could have,” he added. In short, the organization appreciated the quality of both the products and the services provided and were more than satisfied with the end results they produced. “I've been doing this a long time, and we have had all kinds of systems in here before, most of which have been less than durable,” said Gioia. “We have had zero issues with this system, and I couldn’t be happier with it,” he concluded.